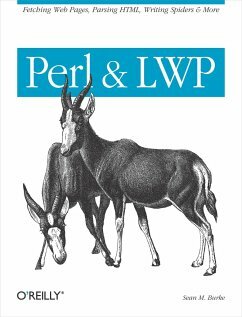 Perl soared to popularity as a language for creating and managing web content, but with LWP (Library for WWW in Perl), Perl is equally adept at consuming information on the Web. LWP is a suite of modules for fetching and processing web pages.The Web is a vast data source that contains everything from stock prices to movie credits, and with LWP all that data is just a few lines of code away. Anything you do on the Web, whether it's buying or selling, reading or writing, uploading or downloading, news to e-commerce, can be controlled with Perl and LWP. You can automate Web-based purchase orders as easily as you can set up a program to download MP3 files from a web site.Perl & LWP covers: * Understanding LWP and its design * Fetching and analyzing URLs * Extracting information from HTML using regular expressions and tokens * Working with the structure of HTML documents using trees * Setting and inspecting HTTP headers and response codes * Managing cookies * Accessing information that requires authentication * Extracting links * Cooperating with proxy caches * Writing web spiders (also known as robots) in a safe fashion Perl & LWP includes many step-by-step examples that show how to apply the various techniques. Programs to extract information from the web sites of BBC News, Altavista, ABEBooks.com, and the Weather Underground, to name just a few, are explained in detail, so that you understand how and why they work.Perl programmers who want to automate and mine the web can pick up this book and be immediately productive. Written by a contributor to LWP, and with a foreword by one of LWP's creators, Perl & LWP is the authoritative guide to this powerful and popular toolkit. Sean M. Burke is an active member in the Perl community and one of CPAN's most prolific module authors. He has been a columnist for The Perl Journal since 1998, and is an authority on markup languages. Trained as a linguist, he also develops tools for software internationalization and native language preservation. Sean is also the author of O'Reilly's Perl & LWP.